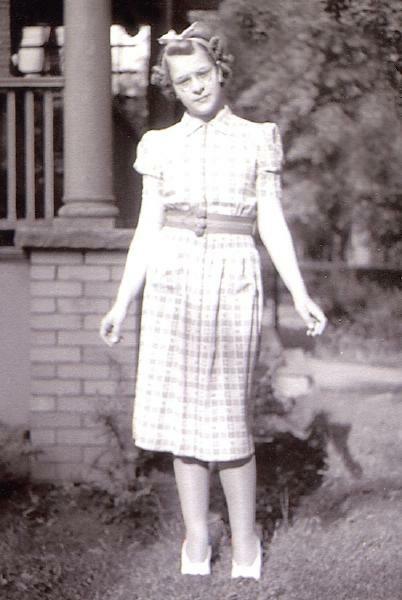 Elizabeth Marie Jacoby was born on 28 May 1924 in Niagara Falls, Niagara County, New York. She was baptized/christened on 28 September 1924 at Zion Lutheran Church in Niagara Falls, Niagara County, New York, sponsored by Carl Adam Kammerer and Elizabeth Susanna Margaret Kammerer. Otto Julius Jacoby and Marie Katherine Kammerer appeared in the New York state census of 1 June 1925 in Niagara Falls, Niagara County, New York, at 1620 Ontario Avenue. Other members of the household included Elizabeth Marie Jacoby, John Otto Jacoby, Frederick Harvey Jacoby and Mary A. Kempf. Otto Julius Jacoby and Marie Katherine Kammerer appeared in the US federal census of 1 April 1930 in Niagara Falls, Niagara County, New York, at 952 Vanderbilt. Other members of the household included Elizabeth Marie Jacoby, John Otto Jacoby, Frederick Harvey Jacoby and Robert Carl Jacoby. Marie Katherine Kammerer appeared in the US federal census of 1 April 1940 in Niagara Falls, New York, at 952 Vanderbilt. Other members of the household included Elizabeth Marie Jacoby, John Otto Jacoby, Frederick Harvey Jacoby and Robert Carl Jacoby. Also in the household was one female lodger. She married Frederic C. Dunning, son of Fred Stephen Dunning and Margaret Grace Few, on 7 September 1946 in Niagara Falls, New York, at Zion Lutheran Church The marriage was witnessed by Fred Stephen Dunning. The following appeared on 21 September 1946 in the Niagara Falls Gazette: Mrs. Otto J. Jacoby, 952 Vanderbilt avenue, announces the marriage of her daughter, Elizabeth, to Mr. Frederic C. Dunning, which was solemnized Saturday, September 7, at the Zion Lutheran church. Mr. and Mrs. Dunning will be at home after today at 952 Vanderbilt avenue. The bridegroom is the son of Mr. and Mrs. Fred S. Dunning, South Avenue. The following appeared on 5 June 1947 in the Niagara Falls Gazette: Births at Memorial Hospital . . . To Mr. and Mrs. Frederic C. Dunning, 952 Vanderbilt avenue, June 4, a son, Richard Frederic. Elizabeth Marie Jacoby became a widow at the 22 March 1983 death of her husband Frederic C. Dunning. The following appeared in the Niagara Falls Gazette: Frederic C. Dunning, 69, of Vanderbilt Avenue died in Memorial Medical Center yesterday (March 22, 1983) after a short illness. Born in Lockport, he was active in the Boy Scouts of America and was a national director of Scouting for the American Lutheran Churches. He was founder and group leader for more than 20 years of Troop 56 in Niagara Falls. He received the Silver Beaver and Lamb awards and was instructor of the wood badge course. He was a member of the Order of the Arrow. He was a purchasing agent for 12 years at Chemical Design Inc., Lockport. Prior to that he worked for the DuPont Co. in Niagara Falls. He is survived by his wife, Elizabeth (Jacoby); two sons, Richard F. Dunning and Mark S. Dunning of Niagara Falls; and four grandchildren and many nieces and nephews. The family will be present from 7 to 9 p.m. today and 2 to 4 and 7 to 9 p.m. tomorrow at the chapel of Cornell & Daggett Inc., South Avenue at 10th Street. Funeral services will be held at a time to be announced. Contributions to the Memorial Medical Center Intensive Care Unit or to a charity of one's choice are acceptable as tribute. The SSDI lists Niagara Falls, New York, as the last residence of record of Elizabeth Marie Jacoby. Elizabeth Marie Jacoby died on 10 May 2004 at age 79 in Niagara Falls, New York. She was interred at St. Paul's Cathedral Columbarium, Buffalo, Erie County, New York. The following appeared on 16 May 2004 in The Buffalo News: Elizabeth (Jacoby) Dunning, of Niagara Falls, entered into rest on Monday, May 10, 2004, mother of Richard (Louise) and Mark (Myra); sister of Richard K. Jacoby and the late John J., Frederick H. and Robert C; grandmother of six and great-grandmother of four; also survived by many nieces and nephews. Services are at the convenience of the family. Inurnment at St. Paul's Cathedral, Buffalo, NY. Arrangements by the Hilliard-Creasy Funeral Home, Inc.